Malvina Hoffman (1887 - 1966) was born June 15th 1887 in New York City. She was the youngest child of concert pianist Richard Hoffman and studied piano from an early age, becoming an accomplished pianist with the New York Philharmonic. Because of the many musicians and artists that frequented the Hoffman house Malvina was exposed to the arts at a very early age and enrolled at the Art Student's League by the age of 14. By the time she was 21 her father was in failing health and Malvina wanted to create a portrait of him. Starting with oil paints she went on to clay to create a 3 dimensional rendition. This later was done in Marble after his death in 1909 and submitted for exhibit to the National Academy of Design where it was received favorably. In 1910 Malvina and her mother traveled to France with a letter of recommendation from the American Sculptor Gutzon Borglum to Auguste Rodin. She was repeatedly turned away from Rodin's studio but the persistence shown by constantly returning paid off as Rodin agreed to accept her as a student. By 1915 Malvina had become an established sculptor in Paris, attracting many of the artists of the day to her home and studio. She started her own foundry to cast her works and became a master founder, writing a book on foundry technique titled Sculpture, Inside and Out that same year. In 1919 after the war she traveled to the Balkans for the American Red Cross, for whom she worked during the war, and then returned to New York. During this time she was to do several portraits of famous artists such as John Muir and John Keats. It was during this time that she received most of her monumental commissions which included war memorials at Harvard, one in England, and one in France after the 2nd world war. In 1930 she was chosen to work on a massive undertaking for the Field Museum in Chicago titled The Races of Mankind as part of their exhibit for the Hall of Man, to be ready for the 1933 Worlds Fair. Initially this exhibit was to be divided among 3 artists but Malvina was to connivence Stanley Field to allow her to create all 104 of the bronzes for this exhibit. This was an enormous undertaking which took Malvina and her husband around the world for several years, visiting every country and sketching and sculpting all of the ethnic types on the planet. 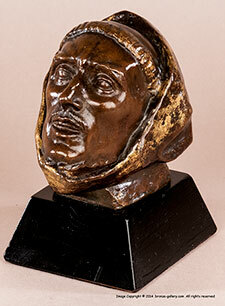 It was the culmination of her work as a sculptor and most of her best bronzes are from this experience at this time. Working out of her studio in Paris she cast most of the 97 bronzes herself and had the 13 marbles done in Paris. Her later years were spent in her studio home in New York City, where she wrote her memoirs titled Heads and Tails and another book titled Yesterday and tomorrow. She died in her East 35th Street studio on July 10th 1966, even to the end of her life doing what she loved the most, sculpting.